We're known for being hard on the Pentatonic Scale, and that assumption might be a tad unjust. The five simple notes aren't what we object too; after all, contained within the set is the harmonic center of root and third, along with the benign pitches of two and six, and of course, neutral chord member number five. There's some great harmonic "training" in these scales. That said, we liken their abuse to the father of a four-year old who fastens training wheels on his son's bike, and leaves them there through High School. There's tremendous potential for use in jazz but if and only if you're willing to 1.) take them out of the key or 2.) use them to express upper chord harmonic extensions. We went over this in a previous tip, Jazzed Pentatonic, and to review as an example, if your harmonic background chord is CMaj7(+11), you can use a D Major Pentatonic to convey the B D F# implied in this chord extension. Another problem is the horizontal abuse of the Pentatonic, the failure to jump around constructively, to weave, bob, and introduce melodic creativity; in other words, you need to avoid sounding like your playing, well... scales! 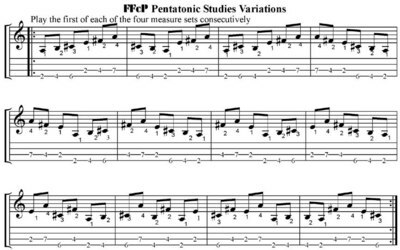 We want to propose an alternative to this potential stagnancy with a terrific drill in yet another installment of our FFcP approach, FFcP Pentatonic Studies. If you want to sneak ahead and download a PDF of the two page exercise, do so now. The following explanations may make more sense with a copy of it in hand. Depending on your perspective, these are chop builders or chop busters, but they give you a whole new way to intuitively build melodic freshness and inspire. You'll struggle somewhat with the challenge of smooth, continuous line, especially in string crossing (go pinky! ), but time spent on these will again be a worthy investment. These measures as we develop in the entire 48 measure exercise are fertile, both physically stimulating and intellectually inspiring. Don't just play them straight down. Master each individual measure, moving on only when they are infused into your fingers, rich with tone and dare we say "musical." Notice they move in minor thirds. (Relative minor/major relationship?) Notice the exercise uses all four of the FFcP positions. The succeeding measures, we'll break the monotony of stepwise movements with skips, turns and contrary motion. We start on different scale degrees, and though the intent is to mix you up well, take advantage of Pentatonic simplicity to think observe which scale degree the pattern starts with and where it goes. You'll cover four of the twelve keys, A C Eb F#. Move the entire exercise up one fret and you've addressed another 1/3 of them Bb Db E G. Go up yet another fret B D F Ab and you've mastered all twelve keys in one octave. Here's another trick. Play the first measure in each line consecutively (1, 5, 9, 13, etc.). Play the second in the same way (2, 6, 10,14, 18, etc.). You'll really develop some physical flexibility. Tritone subs? You've probably heard about this before; notice 1st and 3rd of each 4 measure set are a diminished 5th or a tritone away, same with the 2nd and 4th. 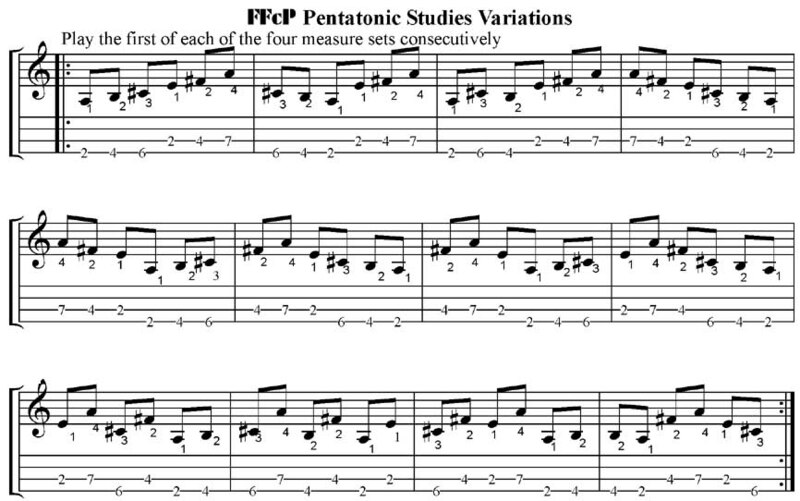 Here's a chance to use the Pentatonics for either some very outside melodic fodder in the same tonal center, or express the tritone substitution in a dominant function, play chords I, V7, I, V7, etc. We shouldn't have to remind you, but we don't want you to lose tone. As we mentioned, the string crossing may seem to kill your 3rd and 4th fingers, but these combinations mastered will lend you incredible dexterity later in improvising. You'll be open to a whole new world of finger combinations across the fretboard. When you really get good, play these in the upper frets, too. 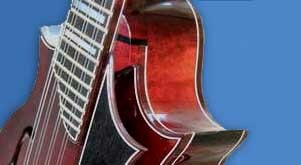 Next time you hear a really good professional jazz guitar player, see how many times you hear material discreetly taken from the Pentatonic scale. It may be well-disguised in rapidly shifting tonal centers, but guaranteed, it will be there more than you think! If you haven't been there already, check out the FFcP downloads, and some fantastic practice materials on our Free Downloads Page. Don't forget to click on a few of the Sponsor banner links at the bottom of the page; forward them your thanks for bringing you this free educational service.